Cells respond to changes in their environment through cascades of molecular switches called signaling pathways. Such pathways involve a tightly regulated series of events, including protein posttranslational modifications, translocation, metabolic alterations and changes at the transcriptional and translational level. Crosstalk and feedback between pathways lead to the formation of highly interconnected signaling networks that control complex cell behaviors. Signaling pathways are reused for different purposes in different cell types of the same organism and their activity is altered in diseases. Thus, the organization of signaling pathways is highly cell-, tissue- and condition-specific. A major goal of our group is to generate a quantitative understanding of the mechanisms that regulate the wiring of signaling networks, and how they vary in different normal conditions (e.g. different specialized cell types in the body) as well as how these networks are dysregulated in disease states such as cancer and retinal diseases. 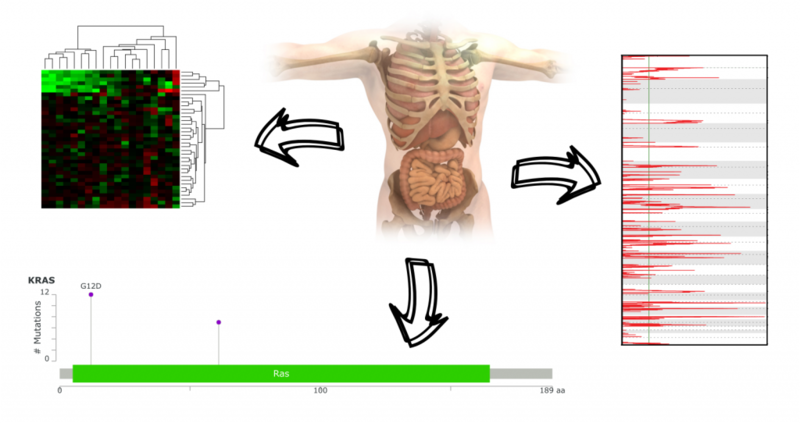 To this end we are combining multi-omics data acquisition with computational and structural analysis in order to generate new hypotheses for experimental validation. 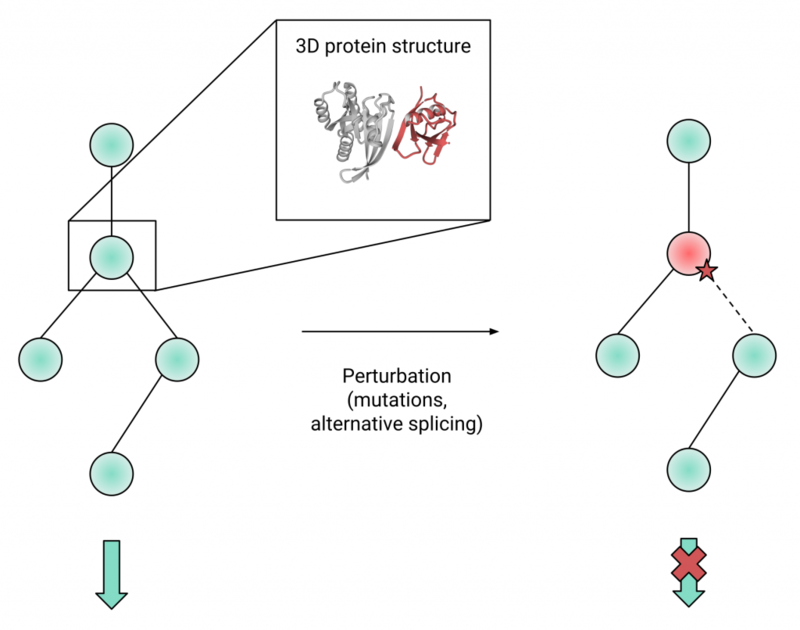 In particular, we investigate how alternative splicing, protein abundances and mutations in kinases and GTPases lead to changes in the local interaction network, for example, through competition for common binding partners or changing binding affinity. Cancer comprises a heterogeneous group of diseases with cancers from different tissues varying in their molecular and clinical characteristics. One of the biggest mysteries in cancer research remains why the molecular alteration profiles differ so much from cancer type to cancer type. We are aiming to understand how both cell inherent factors (e.g. cell type-specific organization of signaling pathways, chromatin organization or cell division rates) and environmental factors (e.g. pathogens or inflammation) contribute to the tissue-specificity of cancer. To this end, we are analyzing molecular alteration profiles of cancer patient cohorts to identify tissue-specific alterations, to produce models explaining the condition-specific occurence of the alterations and to experimentally validate our findings. In particular, we are interested why certain oncogenes (such as KRAS) are undergoing activating point mutations only in a subset of cancer types, the tissue-specificity of copy number alterations and the association of DNA methylation changes with late-replicating regions. Age-related Macular Degeneration (AMD) is a persistent, progressive and incurable disease leading to declining sight that progresses to complete loss of vision. Susceptibility is determined by a combination of genes, environment, lifestyle and age. The interaction of these risk factors during disease onset and progression is not understood and the alterations of cell signaling in AMD are not known. The EYE-RISK consortium addresses the challenges of risk prediction and pathways identification in AMD. 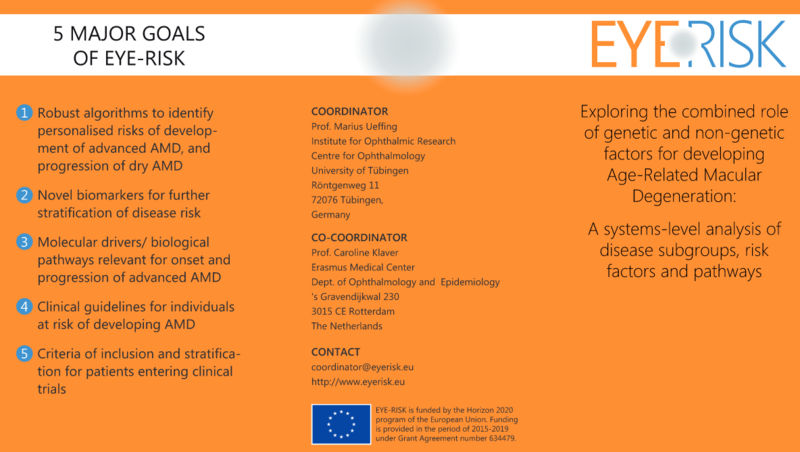 To this aim, EYE-RISK exploits epidemiologist data and biosamples from European epidemiologist eye cohorts and biobank and the approach integrates clinical phenotyping and diagnosis, genotyping, next generation targeted re-sequencing, bioinformatics and statistics, clinical data analysis, computational biology, system biology oriented pathway analysis and modelling.